Deciding whether Porcelain Veneers are a good option for you is a choice that you should make with a dentist you trust. Your dentist will perform an examination to let you know if you are a good candidate for dental veneers and discuss the options for achieving your dream smile. 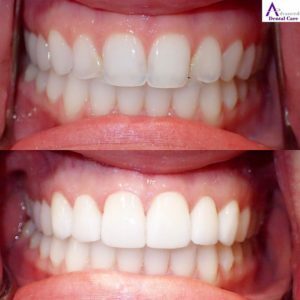 Depending on how quickly you want to start dental veneers, you may achieve your dream smile in as little as two visits to our Costa Mesa dental office. For patients with more flexibility, it is best to take additional steps in the dental veneer process to ensure the best results. Scheduling your initial visit with Dr. Jeremy Jorgenson couldn’t be any easier! You can book online 24/7 or call, text, or email us with you desired appointment times. Once you arrive for your initial visit and have registered, you will meet with Dr. Jorgenson to discuss what imperfections are bothering you about your smile and what your ideal smile would look like. Dr. Jorgenson will conduct an examination to provide all possible treatment options. He will then go over the many factors that must be evaluated when performing dental veneers to ensure we achieve your desired size, shape, shade, and overall aesthetic for your face. 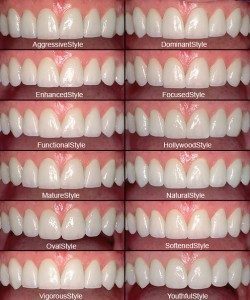 We’ll use before and afters, shade guides, and smile libraries to help you choose the smile that is best for you! 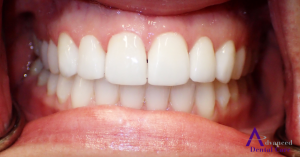 Once you’ve decided to move forward with the veneers process, we’ll start by taking impressions of your current smile so the lab knows exactly where the teeth are currently located and the size, shape, and occlusion of the teeth. After taking the impressions, we send them to the lab with instructions on how to fabricate your Porcelain Veneers. Our lab will create a plaster model of your current smile called a diagnostic cast and place the proposed shape and size veneers on the cast using dental wax. This allows you to envision what your smile could look like in real life 3D! You can review the proposed shape, size, approximate shade, alignment, and overall appearance of your new smile before the lab makes your permanent porcelain veneers. You will work with Dr. Jorgenson to make any adjustments to the diagnostic wax-up. You are finally ready to start the physical preparation for porcelain veneers. Dr. Jorgenson begins by removing a thin layer of your natural tooth enamel to create creating a smooth, flat surface where the porcelain veneer will be placed. We only remove as much enamel as needed to bond the veneer in the proper placement for the most realistic, natural look. This is typically about half of a millimeter. Once the teeth are prepped, a final impression is taken and this impression sent to the lab to make the permanent veneers. Next, we create temporary teeth-shaped coverings from an acrylic material to protect the teeth while the lab creates your permanent veneers. 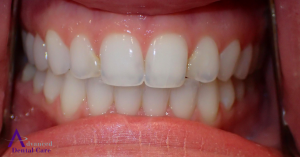 Temporary veneers do not look like permanent veneers and are only created to cover and protect the prepped teeth. For most patients, this is the worst part of the process. You’re expecting a perfect smile, but instead the temporaries aren’t going to look perfect. Temporaries are not meant to last forever so be gentle to prevent fracturing. Avoid hard, sticky foods or foods that stain teeth easily. Your permanent veneers will be ready for final placement in 1-2 weeks. The big day has finally come! You’re ready to finalize your dream smile. On the day of your final placement, you will again be numbed for your comfort. Dr. Jorgenson will remove the temporary veneers and make sure the teeth are clean. 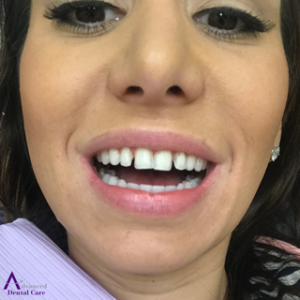 Then he will slide the permanent veneers into place so you can see what your new smile will look like and make any adjustments before the permanent cementation. 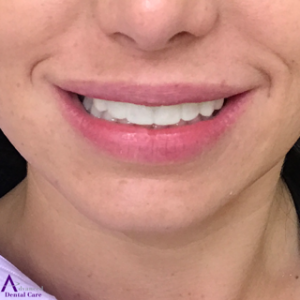 Once you’ve given us the thumbs up, Dr. Jorgenson will polish the teeth and apply an etching solution to the enamel where the veneers will be cemented. The etching material creates a more ideal surface for adhering the porcelain veneer to the natural tooth. Once the tooth is etched, the bonding or specialized tooth-colored cement will then be applied to the veneer and the veneer placed on your tooth. Once the veneer is in perfect position, it is cured or hardened into place using an ultraviolet curing light. This process continues until each porcelain veneer is permanently cemented. Presto Chango! You have achieved your Dream Smile! Advanced Dental Care is a full-service dental office in Costa Mesa, CA. Currently accepting New Patients. In-network with almost all PPO insurances and offer in-house dental plans for no insurance patients. Call (714) 424-9099 or visit www.mycostamesadentist.com to schedule now!